Picture - A Su-30MKI of the Indian Air Force. The Sukhoi Su-30MKI (Hindi:सुखोई ३० एमकेआई) (NATO reporting name: Flanker-H) is a variant of the Sukhoi Su-30 jointly-developed by Russia's Sukhoi Corporation and India's Hindustan Aeronautics Limited (HAL) for the Indian Air Force (IAF). It is a heavy class, long-range air superiority fighter which can also act as a multirole, strike fighter aircraft. The development of the variant started after India signed a deal with Russia in 2000 to manufacture 140 Su-30 fighter jets. The first Russian-made Su-30MKI variant was accepted into the IAF in 2002, while the first indigenously assembled Su-30MKI entered service with the IAF in 2004. In 2007, the IAF ordered 40 additional MKIs. As of July 2010, the IAF has 124 MKIs under active service with plans to have an operational fleet of 280 MKIs by 2015. The Su-30MKI is expected to form the backbone of the Indian Air Force's fighter fleet to 2020 and beyond. The aircraft is tailor-made for Indian specifications and integrates Indian systems and avionics as well as French and Israeli subsystems. It has abilities similar to the Sukhoi Su-35 with which it shares many features and components. The Su-30MKI was jointly designed by Russia's Sukhoi Corporation and India's Hindustan Aeronautics Limited (HAL). The MKI's airframe evolved from that of the Sukhoi Su-27 while most of the avionics were developed by India. The Su-30MKI is more advanced than the basic Su-30MK, the Chinese Su-30MKK, and the Malaysian Su-30MKM .. The aircraft features state of the art avionics developed by Russia, India and Israel which includes display, navigation, targeting and electronic warfare systems. Other key avionics used in the aircraft were sourced from France and South Africa. In 2004 India inked a deal with Russia to domestically produce the Novator K-100 missile for its Su-30MKI fighters. The Novator K-100 missile is designed to shoot down AWACS and other C4ISTAR aircraft whilst keeping the launch platform out of range of any fighters that might be protecting the target. Although not initially designed to carry nuclear or strategic weapons, the Indian Air Force will receive 40 upgraded SU-30MKIs capable of carrying the BrahMos cruise missile possibly by 2012. In addition, there are also plans to integrate the nuclear-capable Nirbhay missile with the aircraft as well. 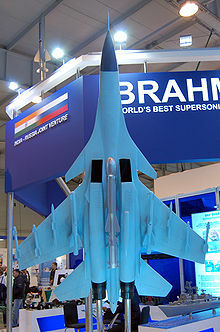 In May 2010, India Today reported that Russia had won a large contract to upgrade 40 Su-30MKI fighters with new radars, onboard computers, electronic warfare systems and the ability to carry the BrahMos missile. 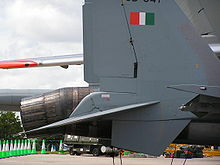 The first two prototypes with the 'Super-30' upgrade will be delivered to the Indian Air Force in 2012, after which the same upgrades will be performed on the last batch consisting of 40 production aircraft. The exact value of the contract has yet to be disclosed however. India is planning to fit its Sukhoi Su-30MKI fighters with Russian Phazotron Zhuk-AE Active Electronically Scanned Array AESA radars. The X-band radar can track 30 aerial targets in the track-while-scan mode and engage six targets simultaneously in attack mode. AESA technology offers improved performance and reliability compared with traditional mechanically scanned array radars.. Indian Defense Minister A.K Antony proposed several upgrades for the Su-30MKI to the Indian Parliament, which included fitting the fighters with Russian Phazotron Zhuk-AE AESA radars starting in 2012. In 1996, after 2 years of evaluation and negotiations, India decided to purchase Su-30MKI aircraft. India signed a US$1.462 billion deal with the Sukhoi Corporation on 30 November 1996 for the delivery of 50 Su-30 aircraft. These aircraft were to be delivered in five batches. The first batch were 8 Su-30MKs , the basic version of Su-30. The second batch were to be 10 Su-30Ks with French and Israeli avionics. The third batch were to be 10 Su-30MKIs featuring canard foreplanes. The fourth batch of 12 Su 30MKIs and final batch of 10 Su-30MKIs aircraft all were to have the AL-31FP turbofans. In October 2000, a MoU (Memorandum of Understanding) was signed confirming the license production of 140+ Su-30MKIs and in December 2000, the deal was sealed at Russia's Irkutsk aircraft plant, with full technology transfer. The first Su-30MKIs from Nasik are to be delivered from 2004, with the original plan of carrying production up to 2017-18. However in November 2002, it was decided that the delivery schedule would be completed within ten years - by 2014 - by increasing the annual rate of production from 10 to 14 aircraft annually. An estimated 920 AL-31FP turbofans are to be manufactured at HAL's Koraput Division, while the mainframe and other accessories are to be manufactured at HAL's Divisions in Lucknow and Hyderabad. Final integration of the aircraft and its test flight are to be carried out at HAL's Nasik Division. The MKI production was planned to be done in four phases: Phase I, II, III and IV respectively. In 2007 another order of 40 Su-30MKIs have been made. In 2009, India planned to acquire 230 Su-30-MKIs. HAL has been directed to end the production of 140 of the original 230 jets under transfer of technology by 2015, instead of the originally scheduled 2017-2018. In 2008, Samtel HAL Display Systems (SHDS), a joint venture between Samtel Display Systems and HAL won a contract to develop and manufacture multi-function avionics displays for the MKI.. A Helmet Mounted Sight & Display system - Topsight-I, based on technology from Thales and developed by SHDS will be integrated on the Su-30MKI in the next upgrade. As of March 2010, sources in the Indian Defense Ministry announced that a contract for 42 more Su-30MKI was in the final phases. In June 2010, it was reported that the Cabinet Committee on Security had cleared the 15,000 crore (US$ 3.41 billion) deal and that the 42 aircraft would be in service by 2018. By August 2010 the number of aircraft had shrunk to 40 and the cost increased to $4.3 billion or $102 million each, comparable in cost to the Lockheed Martin F-35 Lightning II, but lacking in features such as AESA radar or stealth. HAL also expects that total indigenisation of the SU-30MKI program will be in 2010. V. Balakrishnan, general manager of the Aircraft Manufacturing Division stated that “HAL will achieve 100 per cent indigenisation of the Sukhoi aircraft - from the production of raw materials to the final plane assembly,”. Picture - Su-30MKI's canards and thrust-vectoring nozzles are two of the most prominent developments over the basic MK variant. Picture - Mk.3, a further development over the existing MKI variant, will integrate avionic systems being developed for the Indo-Russian Fifth Generation Fighter Aircraft program. The aircraft has a fly by wire (FBW) with quadruple redundancy. Depending on the flight conditions, signals from the control stick position transmitter or the FCS will be coupled to the remote control amplifiers. These signals are combined with feedback signals fed by acceleration sensors and rate gyros. The resultant control signals are coupled to the high-speed electro-hydraulic actuators of the elevators, rudders and the canard. The output signals are compared and, if the difference is significant, the faulty channel is disconnected. FBW is based on a stall warning and barrier mechanism which prevents development of aircraft stalls through a dramatic increase in the control stick pressure. This allows a pilot to effectively control the aircraft without running the risk of reaching the limit values of angle of attack and acceleration. Although the maximum angle of attack is limited by the canards the FBW acts as an additional safety mechanism. 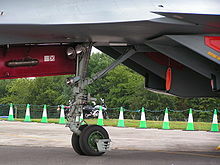 Picture - Nosewheel of the Su-30MKI showing that the diagonal linking strut on the flankers is mounted externally and fixed to the fuselage instead of the gear leg. Beginning in 2010, HUD's and Multi-Function Displays (MFD) will be provided by the Delhi-based Samtel Display Systems. These are native designed and built and are not part of a joint foreign venture. The aircraft is fitted with a satellite navigation system (A-737 GPS compatible), which permits it to make flights in all weather, day and night. The navigation complex includes the high accuracy SAGEM Sigma-95 integrated global positioning system and ring laser gyroscope inertial navigation system. The crew are provided with zero-zero KD-36DM ejection seats. The rear seat is raised for better visibility. The cockpit is provided with containers to store food and water reserves, a waste disposal system and extra oxygen bottles. The KD-36DM ejection seat is inclined at 30�, to help the pilot resist aircraft accelerations in air combat. Picture - Two Sukhoi-30MKIs during a Thach Weave maneuver. Su-30MKI aerodynamic configuration is an unstable longitudinal triplane. The canard increases the aircraft lifting ability and deflects automatically to allow high angle-of-attack (AoA) flights allowing it to perform Pugachev's Cobra. The integral aerodynamic configuration combined with thrust vectoring results in extremely capable maneuverability, taking off and landing characteristics. This high agility allows rapid deployment of weapons in any direction as desired by the crew. The canard notably assists in controlling the aircraft at large angles-of-attack and bringing it to a level flight condition. The wing will have high-lift devices featured as deflecting leading edges, and flaperons acting as flaps and ailerons. The forward facing NIIP N011M Bars (Panther) is a powerful integrated passive electronically scanned array radar. The N011M is a digital multi-mode dual frequency band radar. The N011M can function in air-to-air and air-to-land/sea mode simultaneously while being tied into a high-precision laser-inertial or GPS navigation system. It is equipped with a modern digital weapons control system as well as anti-jamming features. N011M has a 350 km search range and a maximum 200 km tracking range, and 60 km in the rear hemisphere. The radar can track 15 air targets and engage 4 simultaneously. These targets can even include cruise missiles and motionless helicopters. The Su-30MKI can function as a mini-AWACS as a director or command post for other aircraft. The target co-ordinates can be transferred automatically to at least four other aircraft. The radar can detect ground targets such as tanks at 40-50 km. Picture - OLS optical detection pod used on Su aircraft. 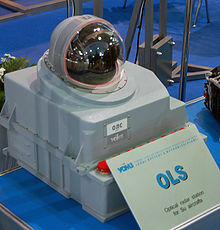 OLS-30 laser-optical locator system to include a day and night FLIR capability and is used in conjunction with the helmet mounted sighting system. The OLS-30 is a combined IRST/LR device using a cooled, broader waveband, sensor. Detection range is up to 90 km, whilst the laser ranger is effective to 3.5 km. Targets are displayed on the same LCD display as the radar. Israeli LITENING targeting pod is used to target the laser guided munitions. Litening incorporates in a single pod all the targeting features required by a modern strike fighter. The original Litening pod includes a long range FLIR, a TV camera, a flash-lamp powered laser designator, laser spot tracker for tracking target designated by other aircraft or from the ground, and an electro-optical point and inertial tracker, which enabled continuous engagement of the target even when the target is partly obscured by clouds or countermeasures. The pod integrates the necessary laser rangefinder and designator, required for the delivery of Laser Guided Bombs, cluster and general purpose bomb. Sukhoi Su-30MKI has electronic counter-measure systems. The RWR system is of Indian design, developed by India's DRDO, called Tarang, (Wave in Sanskrit). It has direction finding capability and is known to have a programmable threat library. The RWR is derived from work done on an earlier system for India's MiG-23BNs known as the Tranquil, which is now superseded by the more advanced Tarang series. Elta EL/M-8222 a self-protection jammer developed by Israel Aircraft Industries is the MKI's standard EW pod, which the Israeli Air Force uses on its F-15s. The ELTA El/M-8222 Self Protection Pod is a power-managed jammer, air-cooled system with an ESM receiver integrated into the pod. The pod contains an antenna on the forward and aft ends, which receive the hostile RF signal and after processing deliver the appropriate response. Picture - The tail section of the Su-30MKI showing the TVC nozzles and horizontal stabilizers. The Su-30MKI is powered by the two Al-31FP turbofans, each rated at 12,500 kgf (27,550 lbf) of full afterburning thrust. These by-pass, thrust-vectoring engines push the aircraft up to mach two in horizontal flight (about 2450 km/h at ground-level) and give a rate of climb of 230 m/s. The mean time between overhaul for the AL-31FP is given at 1,000 hours with a full-life span of 3,000 hours. The titanium nozzle has a mean time between overhaul of 500 hours. Al-31FP builds on the Al-37FU with the capability to vector in two planes. The Thrust Vectoring nozzles of the MKI are mounted 32 degrees outward to longitudinal engine axis (i.e. in the horizontal plane) and can be deflected �15 degrees in the vertical plane. This produces a cork-screw effect, thus enhancing the turn capability of the aircraft. There is no strain-gauge engine control stick to change the engine thrust in the cockpit, rather just a conventional engine throttle control lever. The pilot controls the aircraft with help of a standard control stick. On the pilot's right there is a switch which is turned on for performing difficult maneuvers. After the switch-over, the computer determines the level of use of aerodynamic surfaces and swiveling nozzles and their required deflection angles. Picture - Tail section of the Su-30MKI the deflected nozzles and horizontal stabilizer. The Sukhoi Su-30MKI is the most potent fighter jet in service with the Indian Air Force in the late 2000s. The MKIs are often fielded by the IAF in bilateral and multilateral air exercises. India exercised its Su-30MKIs against the Royal Air Force's Tornado ADVs in October 2006. This was the first large-scale bilateral aerial exercise with any foreign air force during which the IAF used its Su-30MKIs extensively. This exercise was also the first in 43 years with the RAF. During the exercise, RAF's Air Chief Marshall, Glenn Torpy, was given permission by the IAF to fly the MKI. RAF's Air-Vice Marshall, Christopher Harper, praised the MKI's dogfight ability, calling it "absolutely masterful and unbeatable". In July 2007, the Indian Air Force fielded the MKI during the Indra-Dhanush exercise with Royal Air Force's Eurofighter Typhoon. This was the first time that the two jets had taken part in such a exercise. The IAF did not allow their pilots to use the radar of the MKIs during the exercise so as to protect the highly-classified N011M Bars. During the exercise, the RAF pilots candidly admitted that the Su-30MKI displayed maneuvering superior to that of the Typhoon. Picture - IAF Su-30MKI jet touches down at Mountain Home Air Force Base during Red Flag exercise. An earlier variant of the Su-30MKI, the MK, took part in war games with the United States Air Force (USAF) during Cope-India 04. The results have been widely publicized, with the Indians winning "90% of the mock combat missions" against the American force's F-15C. When questioned on the capabilities of IAF pilots, Col Greg Newbech, USAF Team Leader made the following remarks: - "What we’ve seen in the last two weeks is, the IAF can stand toe-to-toe with best AF in the world. I pity the pilot who has to face the IAF and chances the day to underestimate him; because he won’t be going home. Indian hospitality from everyone has been truly overwhelming. The greatest compliment we heard from an IAF pilot, 'You American pilots are just like us, simply down to earth people.' We depart India with great respect for the Indian Air Force. Your pilots, maint and support crew are exceptional professionals.". In July 2008, the IAF sent 6 Su-30MKIs and 2 aerial-refueling tankers, the Il-78MKI, to participate in the Red Flag exercise.. The IAF again did not allow their pilots to use the radar of the MKIs during the exercise so as to protect the highly-classified N011M Bars. In October 2008, a video surfaced on the internet which featured a USAF colonel, Corkey Fornoff, criticizing Su-30MKI's high friendly kill rate, serviceability issues, and relatively poor performance against the F-15C during the Red Flag exercise. Several of his claims were later rebutted by the Indian side. 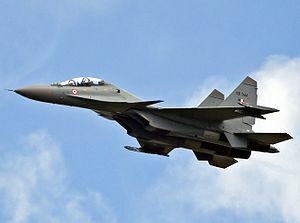 A Su-30MKI aircraft crashed on 30 April 2009 in the Pokhran region of Rajasthan after it took off from Pune during its routine sortie, killing one of its two pilots. Defence minister A. K. Antony, stated that the likely cause of the April 30 crash was "failure of the fly-by-wire system". The Sukhoi fleet had then been grounded for around three weeks. However it was found that this crash at Rajmathai village, around 170 km from Jaisalmer, in April was because of the position of the various critical switches of the aircraft. The switches were behind the pilots and they would have to turn them on and off without looking back. At one point, a wrong switch was turned on, leading to the crash on April 30. Wing Commander PS Nara was killed in the mishap, while Wing Commander SV Munje was injured. After investigators identified the problem, a couple of difficult switches were sealed off. Another Su-30MKI aircraft crashed on 30 November 2009 in Jathegaon, about 40 km from Jaisalmer. The pilots ejected after they saw fire alarm buttons glowing red. Both the pilots are unharmed. This is second such crash of this fighter. The Sukhoi mishaps have come as a setback to the 12 year safety record IAF had achieved with the aircraft which was inducted into the force in 1996. As a result the entire fleet of Su-30MKIs was grounded while the cause of the problem was investigated. It was attributed to accidental ingestion of a foreign material in the engine intake. Indian Air Force - 110+ MKIs in service as of October 2010. 12 hardpoints: 2 x� wing-tip AAM launch rails, 6 x� pylons under-wing, 2 x� pylon under-engine nacelle, and 2 x� pylons in tandem in the "arch" between the engines. It can be increased to 14 using multiple ejector racks. It can carry up to 8 tonnes of external stores. 3 x� Novator KS-172 AAM-L 400 km/Russian air-to-air missile designed as an "AWACS killer"